The disaster level of this nuclear incident, however, paled in comparison to the run-away nuclear reaction of the Chernobyl accident, as the following three facts demonstrated. 1) Nuclear fission chain reactions were fully aborted at P wave detection, before the massive earthquake S wave arrived. 3) Because the reactor type was a light water reactor, contamination was not aggravated by a graphite fire. At Chernobyl, the entire nuclear reactor collapsed, and the build-up of intense heat fused the surrounding concrete, uranium fuel, and steel into a mass. This was a meltdown of a nuclear reactor. As later investigations have shown, the nuclear reactors at Fukushima Dai-Ichi did not reach such a state. The uranium in the reactor pressure vessel, which looks like a submarine standing on end, melted, fell through the bottom, and melted about 60 centimeters through the 2-meter bottom of the containment vessel. In the lexicon of an expert in nuclear reactor physics, this was a “melt-through." The pressure vessels and containment vessels remained structurally standing and locked in the bulk of radioactive substances. In other words, Fukushima Dai-Ichi did not become Chernobyl. The nuclear reactors at Fukushima Dai-Ichi did not experience run-away nuclear reactions, but Prime Minister Kan, who visited the power plant, ran amok. His actions are said to have even delayed the water injection work to cool the reactor cores. The bungled processes at the government's disaster response headquarters were unpardonable The abandonment of invalids and livestock within the 20-kilometer radius caused a number of deaths. We await the report from the accident investigation committee. 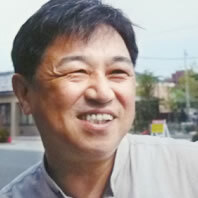 This writer is a radiological protection scientist with site investigative experience beginning in Hiroshima in the research of black rain as a graduate student 30 years ago, and following with the Chernobyl nuclear reactor accident, nuclear explosion disasters of the U.S., Soviet Union and China, and the Tokaimura critical accident. In effect, I have probably investigated the largest number of nuclear disaster sites in the world (see my book, Nuclear Hazards in the World, Springer and Kodansha). During that time, an on-site assessment method of dosimetry for internal and external exposure to radiation was developed and those results were communicated to people in the localities. On this occasion as well, the same method was used to survey local radiological hygiene. Consequently, evidence of low doses has emerged (my book 「福島 嘘と真実」医療科学社(Fukushima: Myth and Reality, Iryokagakusha)2011 in Japanes, and the English version to be published in 2012 ). Annual doses of Fukushima Prefectural residents during the first year of the disaster have been rated at 10 mSv (millisieverts) or less, and the bulk of prefectural residents at 5 mSv or less. On August 6, 1945, the black rain that fell over a wide area in northwestern Hiroshima contained intensive radioactivity, and caused acute radiation injuries such as children's hair loss, diarrhea in cattle, massive deaths of fish in ponds, etc. Such harm has not been reported within the 20-km zone of Fukushima, and the abandoned cattle do not exhibit radiation injyuries. In Hiroshima and Nagasaki, the shockwave and thermal radiation caused destruction and fire concentrically from the respective blast centers, and constituted 85% of the nuclear explosion energy. The remaining 15% came from ionizing radiation. The bulk of the ionizing radiation generated by the nuclear explosion consisted of radioisotopes with half-lives of seconds or minutes. This is because the size of radioactivity is inverse proportion to a half-life. In contrast, the radiation from cesium with a half-life of 30 years is so low as to be virtually ignorable, and has not caused any deaths. After the reactors' nuclear reactions stopped, the leak of radioactive substances occurred in Fukushima after a full day elapsed. Naturally, the disaster did not lead to the situation in Hiroshima, and of course, no shockwave or searing light generated by a nuclear explosion was experienced in Fukushima. Within one month of the accident, the maximum thyroid dosage of 66 individuals whom I tested, including those tested in Namie-machi, was 8 mSv (the proper specialized unit would actually be milligray), or between one-thousands and ten-thousandth of Chernobyl victims. These levels preclude thyroid cancer caused by radiation. I tested 87 individuals for total body cesium radioactivity in the cities of Minami Soma, Koriyama, Iwaki, Fukushima and Nihonmatsu and across all of Fukushima Prefecture, from newborns to adults. Out of this number, 83% were below the detection limit (10 Becquerels(Bq) or less per kilogram). For the remaining 17%, the individual with the largest reading was 165 Bq per kilogram—an estimated annual dose of 0.4 mSv, which is completely within the range of safety, because the annual average dose for internal exposure globally from natural radiation is 1.3 mSv. The value is lower than that. In April, June, and August, I conducted investigations in Fukushima Prefecture for two nights and three days on each occasion with a personal dosimeter on my chest. I entered the 20-km zone for two days in April, as close as the property line of Fukushima Dai-Ichi Nuclear Power plant, and measured a total dosage of 0.10 mSv. For my investigations in June, I travelled to Fukushima, Iitaate-mura, Minami Soma, and Iwaki, and sustained a total dose of 0.01 mSv. My August investigation of Shirakawa, Aizu, and Fukushima resulted in a total dose of 0.006 mSv. After the first month, radioactivity fell to a level of 1/4 or less and continues to attenuate. Thus, the maximum annual dose for many Fukushima Prefecture residents in 2011 was assessed at less than 5 mSv. The total annual dose in 2012, furthermore, would be a maximum 1 mSv in the Aizu Region without special decontamination work. Prefecture residents are deemed to have suffered no health hazards originating from radiation. The national government should take responsibility for, and efficiently decontaminate certain parts of Fukushima Prefecture within the 20-km zone. The goal here is to restore agriculture by achieving an actual maximum annual dose of 1 mSv without natural background radiation for residents, and levels at or below the cesium reference standard for agricultural products. In Namie-machi in particular, farmers have been taking care of cattle, which remain alive. Beginning in February, the author has conducted scientific surveys with the cattle farmers who are enthusiastic about a recovery (to be published in 『撃論』4号、オークラ出版(4th issue of “Gekiron", Oakla Shuppan)). I believe a model project should be launched with several of these cattle farms. Restoration of the entire 20-km zone will require large-scale decontamination of farmland. But instead of tracts of unpopulated mountainous forest, farmland should be assigned a priority. My proposed solution combines two ideas: the construction of a levee against large-scale tsunami in the future and the decontamination operation within the 20-km zone. The coast for a stretch of approximately 40 km can be filled, together with the rubble collected from within the zone, to create a levee park. This was proposed last October in a study group meeting at on-site Iwaki when I was invited as a speaker, and gained support from many participants. Later, I have also proposed this to the Prime Minister of Japan and His Cabinet. After the Great Kanto Earthquake of 1923, the City of Yokohama filled its oceanfront with rubble from 60,000 houses and built Yamashita Park. 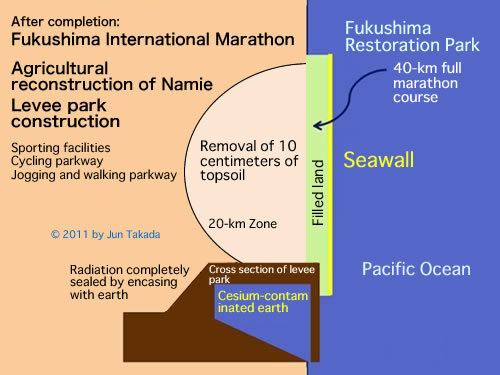 For the 21st century, Japan should be able to build a 40-km levee park in Fukushima. After completion, an international marathon can be held to commemorate the recovery of Fukushima. It is time to show the scientific prowess and strong will of Japan to the world. 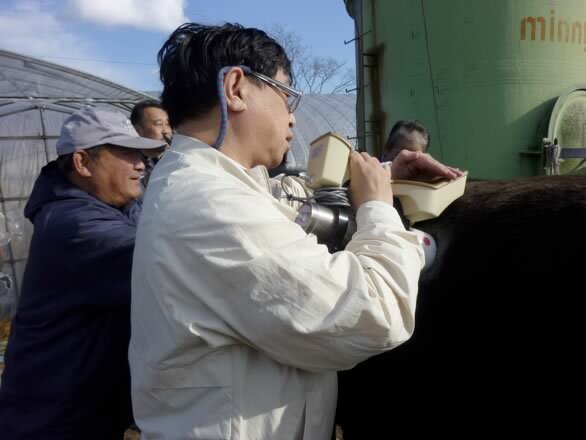 Photo caption: Author testing cattle for cesium in Namie-machi within the 20-km Fukushima Dai-Ichi Zone on February 4, 2012. Some cows had levels below the provisional reference standard. Dairy farming can be rebuilt after decontamination.